Those wacky Aliens and Predators sure love fighting each other. Neither content with starring in their own, often very good films, the two murderous extraterrestrial species have knocked heads in comics, games, and movies, the last of which are so bad even Sigourney “Ripley” Weaver herself found their existence depressing. Having battled across the stars for decades, neither side winning a true victory over the other, audiences have had to content themselves with the war between the two creatures going on forever. This wouldn’t be the case, however, if, in a fit of ‘90s Alien Vs. Predator mania, the saga was brought to an end in the only way it reasonably could have: a 16-bit game of pigskin. 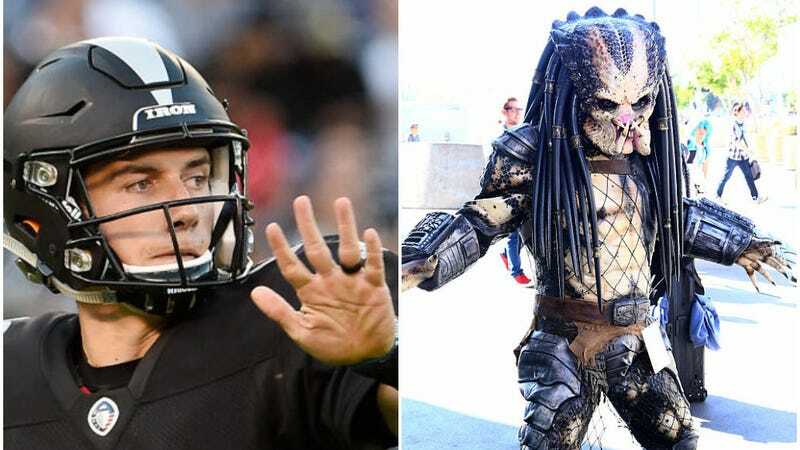 “The Alien Football League and the Predator Football League were born and fierce battles engaged for the Super Bowl Title,” the copy continues. “There was only one new rule. The quarterback must be human.” Well, duh. The above image of an alien ready to grab a football, either with taloned hands or the surprise jut of its phallic nightmare-tongue, is an almost cruel taste of what could have been. Looking at his dumb little jersey, the imagination runs wild with chestburster-impregnated footballs and losing Predator teams laughing before blowing up the stadium. It makes one wonder if it might’ve been better not to know such a thing was possible in the first place.